Machines & Equipment for making Gelato, Soft Serve and Frozen Yogurt. Crew Australia is a catering equipment importing company who specialise in machines and equipment for the gelato, soft serve and frozen yogurt producers. Specialising in the onsite production, our range of machines allow you to produce and serve a genuine and high quality product direct to your customer in your niche food shop or restaurant. It's the quality of your food which builds your business and the quality of our machines which builds ours. This partnership is what makes you an integral part of Iceteam 1927 in Australia. We have brought the world's leading brands of Catabriga, Electro - Freeze, Promag / Ott to Australian shores, providing you with reliable, cost effective solutions for your business. Brands under the Crew Australia / Iceteam 1927 Group. Gelateneo is a training facility inspired in the CATTABRIGA traditional values of excellence, now at disposal of all the ICETEAM 1927 brands. Our training school will teach you everything you need to know about making quality gelato right here in Australia. We are proud to have Gelateneo in Australia and will be making our school available to our customers and their staff though out 2014. In 1927, a talented Italian engineer named Otello Cattabriga patented a mechanical system to make Italian gelato. The system actually imitated the “Stir & Stick” movement of Italian gelato makers of his time. Since then, the name Cattabriga has been synonymous with top quality gelato, not to mention a source of major technological leaps in the industry. Today, after 85 years, CATTABRIGA still maintains a tradition of excellence and innovative solutions. Bocchini offers a wide range of products and integrated services for the full implementation of commercial premises thanks to a precise distribution of activities under the concept of matching food display units. Now you can have hot or cold displays in a matching set i.e. a cold glato display with a desert cabinet and a hot bain-marie unit. Our range is one of only a handful in the world that works on this display matching concept. Customer's satisfaction and confidence are unavoidable goals for company Scaiola. We were able to achieve these aims only through our key values of : Experience, Seriousness, Safety, Service, Guarantee, Quality and Price. But our real references are thousands of costumers who are making use of our products in total safety, every day on their premises. Contact Crew Australia for details and supply of our world leading products. 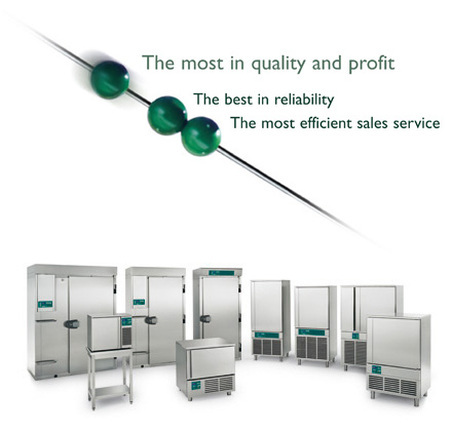 Hiber are the leaders in International refrigeration solutions.